During a mission for the Justice League both Red Arrow and Vixen are trapped beneath a mountain of steel and concrete that used to be the Watergate Hotel in Washington, D.C. Roy tries to calm Mari down while keeping a cool head himself. He coaxes Vixen to use her animal powers but eventually Mari admits that she hasn't been able to access those abilities since the fight with Amazo. Instead she has been able to tap into the abilities of the heroes around her. At the moment she can use Black Lightning's abilities and since they are surrounded by water having electrical abilities isn't very helpful. Vixen finally decides to make a swim for it since all of the lead in the rubble would obscure Superman's x-ray vision. She comes up again, unable to find a way out. Roy reassesses the situation and finally realizes that the water is actually pooling at his head, which means the water is not actually up but down. The two make a break for it and finally escape. Story - 3: From the beginning I have been what you might call a supporter of Brad Meltzer on this book. I enjoyed both "The Archer's Quest" and IDENTITY CRISIS immensely and felt that Meltzer has a real good handle on the characters he writes. His treatment of certain characters may be different than others, but it always seems to be true to the story at hand. This was the case in "Walls". Instead of a super-hero brawl with a cavalcade of men and women in tights Brad gave us a moody little piece that played upon my phobia, the fear of enclosed spaces. While I don't start having a panic attack in the elevator I do have my share of claustrophobia issues. Because of this I really felt something for what Roy and Mari were going through. I also enjoyed the twist at the end, which I honestly didn't see coming. All in all this should have been a great issue of JUSTICE LEAGUE. The thing is that looking back on Brad's JUSTICE LEAGUE run as a whole I can't say that it was anything special. It was entertaining. I enjoyed myself. They weren't bad in just about any sense of the word. My problem comes from the fact that nothing much of consequence happened. Sure the League reformed and they have a keen new headquarters and they teamed up with the Justice Society, but I can't shake the feeling that all of this shouldn't have taken up ten issues of the book. Sure there wasn't a super hero brawl, but maybe there should have been. I know that story telling has changed over the years and that these days the six issue story arc is pretty much the norm. So in a way I can't fault Meltzer for telling his stories in such a manner. It does allow for more of that characterization I was talking about earlier. The thing is I think that many writers, Meltzer included (at least as far as this title is concerned) are spending so much time on character that stories are getting dragged out. It's not laziness. At least I don't think its laziness. Most of the time I really enjoy it, but after twelve issues (including number zero) I thought that more would have been accomplished. I don't like feeling this way. I don't have anything against Meltzer on a personal level. I think he is a solid writer of comic books, but it's hard to get really excited about the next issue when I can't be sure that anything of consequence is going to happen. Yes Roy and Mari were trapped. Yes there was the big reveal concerning Vixen turning into a more toned down version of Rogue. I can even see that after a storyline like "The Lightning Saga", which I very much enjoyed, that you might want an issue to unwind. The thing is that events haven't been super charged enough to warrant that. I don't begrudge Brad his right to tell whatever kind of stories he wants to. I just didn't like this issue as much as I have the previous eleven. I fully admit that this stems from my general fatigue of the decompressed style of storytelling. The weird thing is that next issue is Brad's last and I'm actually going to miss him on the book. Maybe with a little more time things would pick up. Art - 4: Despite the malaise I felt over the story itself I was rather taken with the artwork. Gene Ha is a phenomenal artist and he captured the feeling of being trapped perfectly. This was another instance of the right artist being paired with the right story. 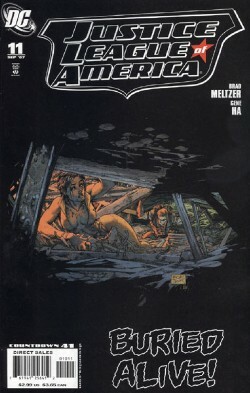 Cover Art - 2: (Standard Cover by Michael Turner) Wow, a Turner cover showing cleavage. What a surprise. What a complete and total shock to the system. Who would have guessed that Michael Turner would turn in a cover that shows Vixen in the foreground with the camera going right down her shirt? Sigh. This was the best they could come up with? Cover Art Alternate - 4: (Alternate Cover by Gene Ha) My only real problem with this cover is that it has nothing to do with what is going on inside the book. 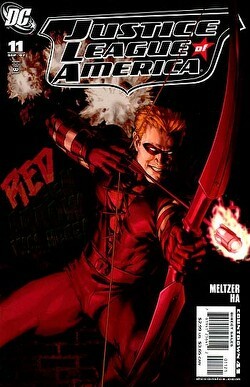 Still, this is a great shot of Red Arrow in action. In all honesty I would have preferred this as the regular cover and Turner's as the variant, but maybe that's just me.